Tree Top is a large beautiful property with a modern beautiful exterior and interior. Hardwood floors, stainless appliances, flat-screen TVs - everything is new, luxurious and waiting for your personal enjoyment. The pictures capture some of the beauty, modern design, nature and open spaces. Take a look at those and drink it all in! 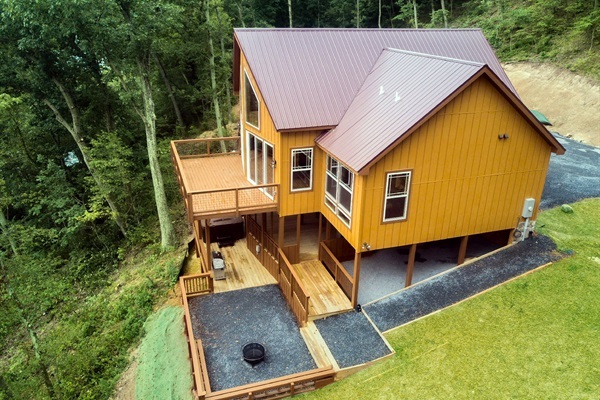 Something we're extra proud of - Tree Top was built with disabled individuals in mind. From the front stoop to the wider doorways and low-entry showers/sinks, we did our best to accommodate wheelchairs. The house may not be perfect for every disabled individual - ask us about it if you're not sure - but it was considered heavily ahead of time and incorporated into the design. In terms of size, Tree Top can fit larger groups of 8 but would also work for a couple or small family. There are three (3) bedrooms and two (2) full bathrooms. The third bedroom is the large loft area you see in the living room pictures. There is a queen and two twin beds in that loft area. The main two bedrooms both have queen beds. You're going to love your time here. As we work to enhance, expand and grow this property, we continue our mission to be your weekend river cabin of choice. Book now before your dates are gone!